If utilizing social media opportunities is a must for your business, you should never assume that the people you hire are already aware of how to best take advantage of it. Whether your focus is on well-known giants like Facebook and Twitter or smaller, lesser-known social media channels, the training you offer to your employees will play a large role in determining how well they are able to work for you. If you decide to create online training to teach your team about best practices in social media is an absolute must, you’ll find no training course tool fits your needs better than ProProfs Training Maker! Step 1: Dive Right In! 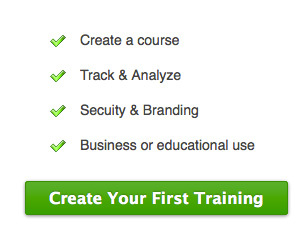 With offerings ranging from absolutely free to low monthly fees for extended branding options, nothing more is required to get started with ProProfs Training Maker than quickly creating an account on their site; you’re able to begin work on your first course within seconds of visiting! With all courses broken down into simple chapters, the pages within those chapters are the key to adding information, media and tests for your trainees. If you’ve ever worked within a simple word processor (Microsoft Word or Corel WordPerfect, for example) then you’ll feel instantly at home with the interface offered by ProProfs Training Maker. Create a new page with the click of a button and begin by adding information – even existing documents and media – quickly, easily and very efficiently with the simple but powerful ProProfs Training Maker interface. Social media platforms demand a clever use of words and multimedia and you can include graphics, videos and even presentations into your online training course to help get that point across. When focusing on best practices in social media, consider including statistical graphs in image format to show your trainees the numbers behind successful social media approaches or adding a video to give even fresh social media converts an overview of how it all works; with no limit on the amount or type of media files that you include, your training options are similarly limitless! Use the statistics gathered about your trainees during their work inside of your online training courses and quizzes to help you determine where each new hire fits as a single cog in your business machine. Learning where best to adjust your approach to training with the simple course editing tools available in ProProfs Training Maker in just as easy, helping you to ensure that you’re giving your budding social media experts the tools that they need to excel. The digital world that we work in is proving to be more and more complicated every day with innovations in social media constantly pushing our business models to evolve and adapt. Maximizing your team’s ability to utilize social media in order to expand your business’ online presence and reach is an important goal as you work towards increasing your profitability; one sure way to extract the best possible return every time you hire is to ensure that you offer all of the tools necessary to teach your employees how to use social media in a deep and effective way. When it comes to social media training courses, no software suite does it better or less expensively than ProProfs Training Maker!